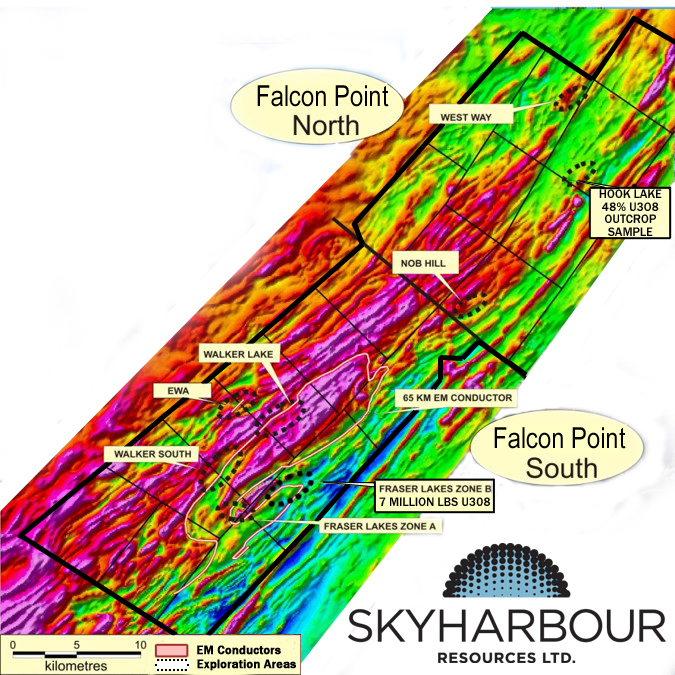 Vancouver, BC - Skyharbour Resources Ltd. (TSX-V: SYH) (OTCBB : SYHBF) (Frankfurt: SC1N) (“Skyharbour”) is pleased to announce it has received drill permits for its 100% owned, 79,003 hectare Falcon Point Uranium and Thorium Property (the “Property”) located 55 kilometers east of the Key Lake Mill. The diamond drill program is slated to commence shortly and will consist of drill testing high-priority targets including areas in and around the current uranium and thorium resource at the JNR Fraser Lakes target. This will be the Company’s first work program at Falcon Point (previously called Way Lake) since acquiring the Property from Denison Mines in the summer of 2014. Approximately 1,500 metres of drilling by way of 5 �" 6 holes with depths of 200 �" 300 metres is expected to be completed at the JNR Fraser Lakes target area during the current campaign. The current deposit at this target area consists of an NI 43-101 inferred resource totaling 7.0 million pounds of U3O8 at 0.03% and 5.3 million pounds of ThO2 at 0.023% in 25 holes totaling 4,603 metres. The near-surface deposit was drilled no deeper than 150 metres vertical and is open along strike and at depth, and consists of a zone of moderately dipping, multiple-stacked uranium and thorium mineralized horizons. Geological and geochemical features at the deposit show distinct similarities to high-grade, basement-hosted uranium deposits in the Athabasca Basin such as Eagle Point, Millennium, P-Patch and Roughrider. 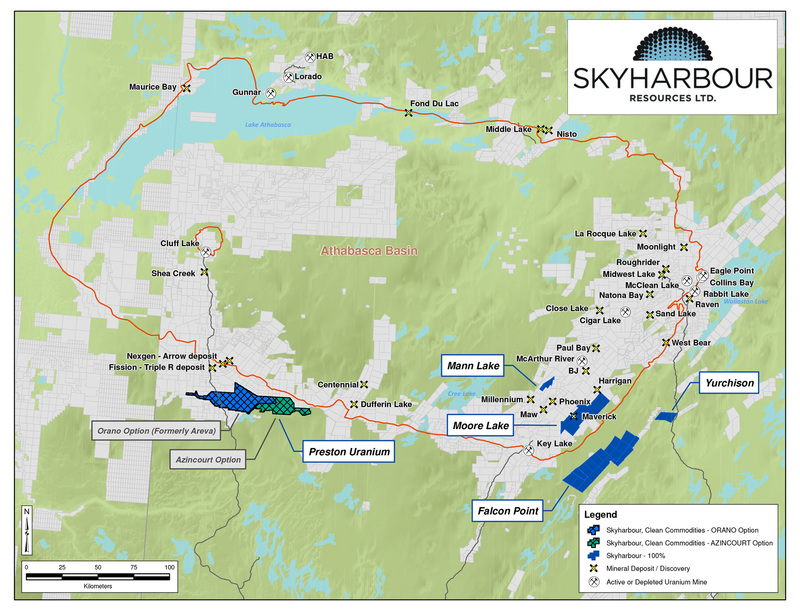 Skyharbour’s objective is to discover higher grade uranium and thorium mineralization proximal to the current lower grade mineralized envelope present at the JNR Fraser Lakes target. Uranium and thorium showings in the JNR Fraser Lakes area (Zone A, Zone B, North and T-Bone) were discovered by ground prospecting of airborne geophysical targets. The mineralized zones are contained within a 65 kilometre long, folded EM conductor system comprised of Wollaston Group graphitic pelitic gneisses and uraniferous granitic pegmatites. Discovered in 2008, the JNR Fraser Lakes Zone B deposit is located within the broader 6 kilometre by 7 kilometre JNR Fraser Lakes target area. Uranium and thorium mineralization is accompanied by highly anomalous concentrations of base metals, rare earth elements and other pathfinder elements. 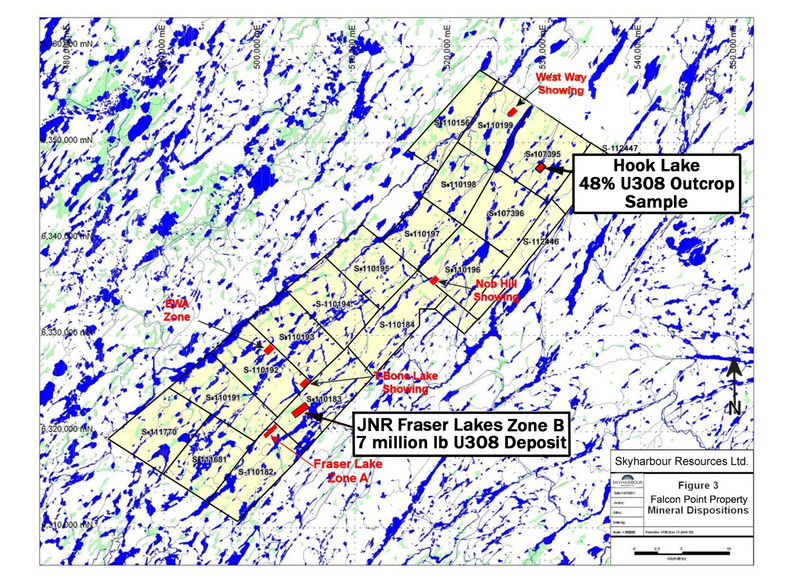 The exploration potential of the Fraser Lakes target area is considered exceptional, including the resource expansion potential of the current deposit at Zone B.